If you still haven’t acquainted yourself with Murray Whelan, then it’s high time you did. With the release earlier this year of Shane Maloney’s latest Whelan novel, Sucked In, now’s the perfect time to read his first three adventures, bundled together nicely in a single volume. Great value. You know it makes sense. Shane Maloney is one of Australia’s most popular novelists. 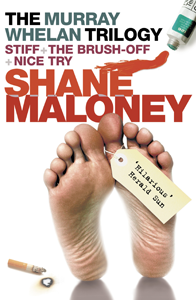 His award-winning and much loved Murray Whelan series – Stiff, The Brush-Off, Nice Try, The Big Ask, Something Fishy and Sucked In – is characterised by a strong sense of humour and an acute sense of Melbourne’s political and cultural nuances. He has been published in the UK, Germany, France, Britain, Japan, Finland and the U.S.